The following is a guest post about where to buy commercial real estate. If interested in submitting a guest post, please read my guest post policy and then contact me. Investing in real estate requires elaborate planning in terms of finances and prospecting for the best localities. Some investors prefer the leafy suburbs whereas others value the downtown areas. Buying commercial real estates in suburb or residential areas has its pros and cons. The decision lies with the buyers needs. Real estates in suburb areas tend to be associated with very affordable prices. This is attributed to the fact that population distribution in such places is very low. These fair prices will be significant in attracting individuals to buy commercial real estates in these cool environs. This implies a reduced cost in terms of capital expenditure on the part of the buyer. Since the places are far away from the busy towns that are populated with industries that emit all types of pollutants, they fresh air in this regions tends to promote good health for the people living there. Suburbs provide an opportunity to enjoy the social facilities without being subjected to artificial shortages such as water rationing. This is of great benefit since no additional costs will be incurred in engaging a contractor to supply the commodity. Security tends to be optimum because most idlers associated with criminal activities do not fancy areas away from towns. This enables the buyers to have peaceful time and hence focus on more productive activities. Transport is available at standard rates and cases of delays attributed to traffic jams are unheard of. This provides an enabling environment for businesses to thrive. Real estates built in the suburbs normally will have large compounds. These can then be improved to provide spacious parking space for the buyers. This implies that these estates also have the ability to provide recreational grounds for sporting activities. Despite all these numerous benefits attached with the suburbs, a few challenges exist. Most people do not like remote places due limited services. This may be a hindrance towards making a timely return on the investment because it may take a long time to find and get potential tenants. This also has its advantages as well as disadvantages. The ones below can guide you in making your decision. 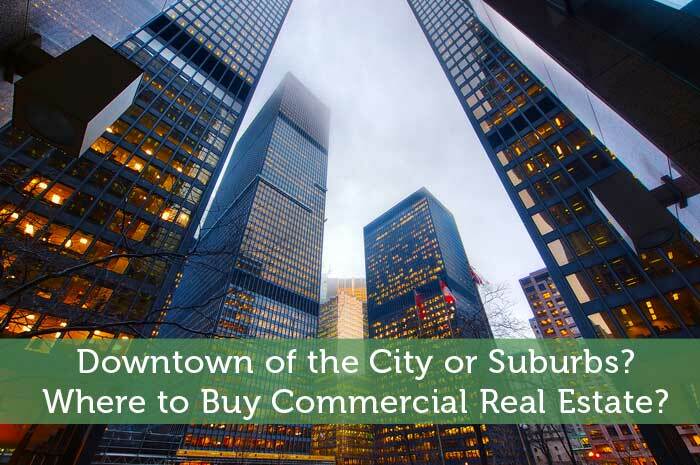 Buying a commercial property in a downtown area means that returns will be realized immediately. The demand for housing is very high coupled with a high population. International organizations prefer to have their affiliate offices located in towns and pay an attractive rate. This enables the buyer to expand the real estate empire within the shortest time possible. Most service providers are strategically located within the town. This means that should there be any faulty equipment or emergency need, and then the issue can be sorted out promptly without unnecessary delays. The availability of numerous modes of transport enables the swift movements of both people and goods. Goods for sale are intended to reach their destinations without delay especially if they are perishable. Most commercial properties involve shops and other forms of retail outlets and therefore the well constructed roads in the downtown areas are convenient for them. Communication is an important aspect of business and life in general. Urban areas provide a reliable communication network suitable for those people living there. Buying a commercial real estate in the towns may enable the buyer to access credit facilities from commercial banks. The attractive locality forms a reliable source of security for the loans that can be advanced to the owners to enable them acquire more estates. Commercial estates require an adequate and constant supply of power. This is only applicable in towns where diesel powered generators are evenly distributed to provide electricity in the event the supply from the national grid is unavailable. Due to the high demand for real estates in industrial towns, buyers may end up purchasing units that do not meet the required standards as outlined in the building regulations. These structures tend to collapse once occupied. As a result buyers will end up incurring huge financial loses which may take quite some time to recover. Local authorities in towns tend to have many bureaucratic by laws relating to the purchase of real estates. Buyers end up spending a lot of funds in order to obtain the necessary documents. The process may take several days hence the buyer ends up spending a lot of time making a follow up. This denies people the opportunity to attend to other equally important issues at the appropriate time. Commercial estate owners in towns may suffer sudden financial loses occasioned by the need to expand and construct new roads. It calls for the demolition of the housing units so as to create the required space. One can now make a decision basing on the above points to decide the best place to buy a commercial real estate. Downtown of the City or Suburbs? Where to Buy Commercial Real Estate? This is one investment area that I have only treaded lightly, with a single residential rental property. Commercial real estate is something I haven’t really thought about but will have to keep in the back of my mind. So have I. I almost bought some commercial real estate at a tax auction, but it was not the right time in my life. Looking forward to investing in this area soon. I’d love to get into real estate investment and I could see some real benefits to going with commercial property rather than residential. Dealing with business owners could be a lot easier than trying to screen random residential tenants. a neighborhood called Collingswood. It is right across the bridge from Philadelphia. It is a suburb with a downtown section that is very walkable. To get to Philadelphia is easily accessible by light rail and it’s less than a five minute ride. I think places like this is the best of both worlds and a great investment. I agree that areas like that could be a great investment. You just have to be sure it is still popular enough that there isn’t a high level of tenant turnover. The extra hassles and potential rent free months could ruin the investment. Like all real estate, this seems like a local question. In other words, I think it depends on what specific city/suburb complex you’re talking about. For sure…the potential will vary immensely depending on the area. That’s why it’s crucial to do the necessary research before diving in. This is a great overview. I think I’d stick to the suburbs, but that’s just because cities make me uneasy. I’d never be able to feel comfortable if I owned something downtown. Interesting viewpoint Jake. That highlights how you have to be comfortable with all aspects of your investment. If being downtown makes you more worried, then yeah suburbs may be a better target. I completely agree. You stand to gain a lot more if you are investing somewhere with more potential growth. A lot of times you can see trends in a city’s growth based on where new condos are being built and what areas have the most room to grow. While buying in urban areas certainly attracts more employees, the suburbs (my personal favorite 😉 ) are definitely more affordable and generally nicer areas to work. However, store fronts attract fewer customers in the burbs. Yes there are pros and cons to both sides. A business could struggle a lot more if they’re not in a practical location resulting in high tenant turnover. I’m sure some suburbs would still work out well though. I would avoid a remote location, if it is just one business and not much around it, unless it is a walkable area and it would drive foot traffic too. As part of a little commercial complex with half a dozen other shops you get the advantage of having their customers notice you too. The other part to remember is that not all businesses even have storefronts. There are also warehouses, manufacturing plants, offices, etc. So being remote isn’t necessarily a bad thing, but the employees would still want local amenities. Just depends on the area honestly. I have seen a few commercial business really do well in the suburbs simply because they are in plazas or are the only ones there and people need what they have and would prefer going there vs driving miles away. You have to pick the right business for the location. Putting a Chanel store in the middle of a rural area doesnt make much sense. I think a lot would depend on if it’s a business with a limited market or something that is in demand more universally. Some people would definitely prefer the closer option. Other businesses do need to be around a specific type of clientele though. I personally would buy commerical real estate downtown for the opportunites but of course it depends on the city. I wouldn’t want to live downtown in our city, its not my preference but commerical real estate is great here. I’d think commercial real estate downtown may be a lot easier to manage as a business could thrive there and would be more willing to pay high rent. Plus a wider variety of businesses could work there.